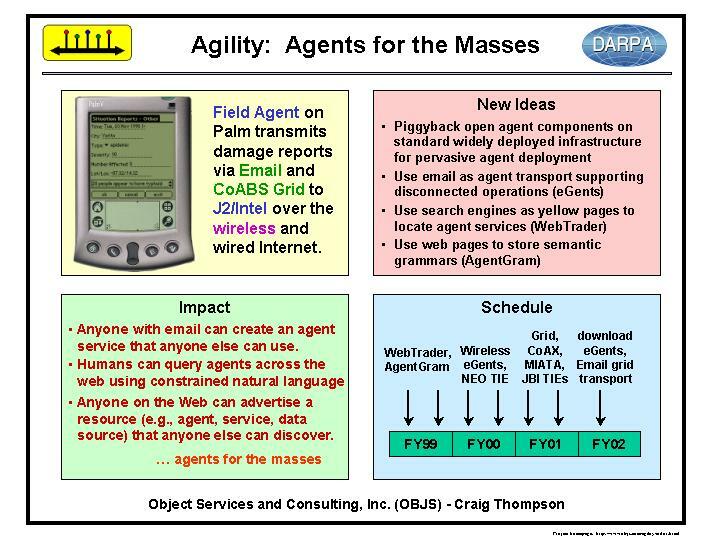 Project Overview -The objective of the DARPA/CoABS Agility project is to develop a light-weight agent grid architecture and implementation that is scalable and pervasive by virtue of piggybacking on existing and emerging standards (e.g., email, web, search engines, Java, Jini, xml, distributed objects). Agility grid components should be separately useful but also composable and interoperable with GITI grid components. Workshop Paper: Agents for the Masses (.doc), Thompson, Bannon, Pazandak, and Vasudevan, invited paper, Agent 99 Workshop on Agent-Based High Performance Computing: Problem Solving Applications And Practical Deployment, Seattle, May 1 1999.
eGent Email Agent Prototype - eGent provides a scalable way to send (FIPA or KQML) ACL messages encoded in XML by email, providing a light-weight agent platform that inherits many benefits from email: pervasiveness, disconnected messaging, security, firewall access, mobile users, logging, visualization. Any agent can offer services to any other using this architecture. WebTrader and DeepSearch Prototypes - Webtrader is a trader which relies on web-based search engines to locate advertisements (want ads, classifieds) represented in XML that reside on web pages anywhere on the web. The architecture is scalable by virtue of web search engines and federation is supported by means of advertisements for other webtraders and search engines. Menu-based Natural Language Interface (MBNLI) and AgentGram Prototypes - Using MBNLI, end users select words and phrases from menus to construct sentences the system will understand - this takes the guess work out of NLI technology. AgentGram uses MBNLI and dynamically loaded grammars attached to agents to permit complex queries that may involve knowledge of several agents and provides a way for humans to task agents and for agents to communicate with each other. Agility Grid - One of the main objectives of our work in FY00 is to integrate the Agility components together with the GITI Jini grid implementation and make them Web-ready. characterizing the agent grid - Our paper on "Characterizing the Agent Grid" establishes a firm connection to related work on grids, describes several useful views of the grid architecture, and identifies many of the open issues. providing a strawman agent reference architectureto describe the CoABS work to others in DARPA/DoD and to standards development organizations. Tech Transfer - Our approach to transfering Agility technology is to develop and fan out prototypes, participate in the CoABS NEO TIEs and affinity groups and in related DARPA ISO efforts (e.g., ALP and ISO Architecture Working Group) to insure our CoABS architecture ideas and implementations are transferred to others in DoD, lead in industry standards areas related to agents, and publish papers that describe our work. Standards - One of the ways to make CoABS and agent technology pervasive is to work through leading standard organizations. Our approach is to lead and not follow, transferring our work to standards groups as it is informed by our implementation experience. Submitted Strawman Agent Reference Architecture in response to FIPA CFP-99 and at request of Sun Agent Research Team. © Copyright 1998, 1999, 2000 Object Services and Consulting, Inc. Permission is granted to copy this document provided this copyright statement is retained in all copies. Disclaimer: OBJS does not warrant the accuracy or completeness of the information in this survey. Send comments to Craig Thompson. Back to OBJS homepage.